Hogarth, William (1697 London 1764). Frontispiece to (Dr. Brook) Taylor’s Perspective. Center front putto sitting with the back to the high bank, Palladio’s l’Architettura on the lap, beside him on the ground Taylor’s Architectonic Sector (see below). On the right life-size model of a capital as well as plans from which a beam of light, into which the putto points, too, tapers off into the distance passing a temple of muses in the middle distance left. In its back beyond the water locality at the foot of a rugged mountain, further highlands. Front left tree accessory. Engraving by William Woollett (Maidstone 1735 – London 1785). Inscribed: Wm. Hogarth. July 1760. / Wm. Woollett. sculp., otherwise in the upper margin as above. 9⅝ × 15⅝ in (24.5 × 39.8 cm). Nagler, Woollett, 26 ( “very rare” ). 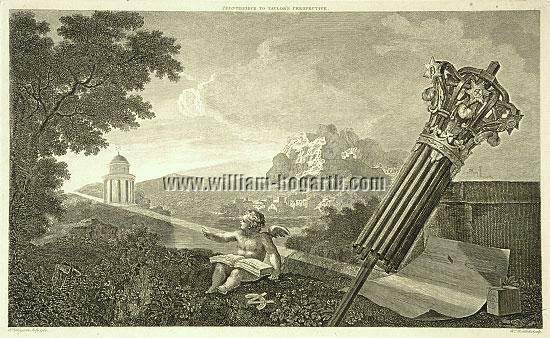 – Very fine, extremely wide-margined impression from the plate retouched by the royal engraver James Heath (1757 London 1834) about 1822 (“Even these impressions have become relatively rare today though”, Art Gallery Esslingen 1970; and Meyers Konv.-Lex., 4th ed., VIII , 625: “A fine edition”, esteemed also already by contemporary collectors of the rank of for instance an A. T. Stewart [Catalog of the Stewart Collection, New York 1887, 1221, “fine plates”]). the elder George Adams, mathematical instrument maker to George III, had made together with further ones according to Taylor’s methods. Brook Taylor (1685-1731) of Bifrons House, Kent, is regarded as after Newton and Roger Cotes the most important mathematician of England. He lacked, however, the talent to express his demonstrations with the necessary lucidity and completeness so that a good part of their effect was lost. So also his Linear Perspective of already 1715, setting forth the principles of art more original and general than ever before, received general acknowledgement only by Kirby’s treatises.